211 Bernard: Tonight at 7:00 p.m.: Conundrum launch with James Cadelli, David Collier, Lorina Mapa! Tonight at 7:00 p.m.: Conundrum launch with James Cadelli, David Collier, Lorina Mapa! Join Conundrum Press for an evening of comics from around the world! Rina Mapa takes us to the Philippines with her new graphic memoir Duran Duran, Imelda Marcos, and Me. 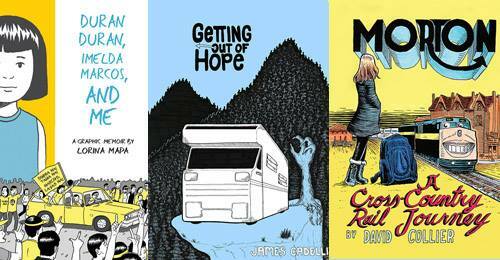 James Cadelli takes us through an apartment building in Hope, BC launching his debut graphic novel Getting Out of Hope. And "national treasure" David Collier goes coast to coast as only he can in his graphic memoir Morton: A Cross-Country Rail Journey. The evening will feature maps! new wave! 1980s nostalgia! polar bears! pianos! and of course trains, planes, and RV campers! and hosting it all will be local artist and aerialist Meags Fitzgerald! - It is not a sober space, our events sometimes offer alcohol.